A broad range of local environmental organizations will be in attendance, with individuals from Catskill Mountainkeeper, Hudson Solar, Riverkeeper, Seeding Sovereignty, Citizen’s Climate Lobby, New Yorkers for Clean Power, New York Heartwoods, Sustainable Hudson Valley, LabX presented by National Academy of Science, Hudson River Sloop Clearwater, Bread Alone, Stop NY Fracked Gas Pipeline, Citizen Advocates for Sustainable Energy (CASE) and Transition Catskills. Hope on the Hudson 3: Seeds of Hope – Teaser Trailer from Oceans 8 Films on Vimeo. Following the 2017 Hudson River at Risk and Hope On The Hudson programs that invited Hudson Valley environmental advocates and green organizations to connect with local residents, ONE Fair also brings the return of the HOPE ON THE HUDSON series, presented in collaboration with Good Work Institute and Oceans 8 Films. The event will include a screening of Seeds Of Hope, the latest from award-winning environmental filmmaker Jon Bowermaster, and will form part of the Hope On The Hudson screening tour spanning Saratoga to Battery Park. Seeds of Hope follows the Akwesasne Tribe of Northern New York, Hudson Valley Farm Hub and Seedshed from planting to harvest as they honor Native American seeds that are at risk of disappearing. Can they preserve their rich agricultural heritage and the stories that each seed holds? Filmmaker Jon Bowermaster will be in attendance for a Q & A. An educational wildlife presentation with live birds of prey and reptiles! We’ll be discussing the incredible resiliency of the Hudson Valley and some of the success stories of our local wildlife. Tim Guinee, Hudson Valley resident and leader in former Vice-President Al Gore’s Climate Reality Project, will present a slideshow and discussion of the latest science regarding climate change, the many reasons we have to be hopeful in confronting this crisis. Mary Evelyn and Ryan Pearson, two first time homeowners, share the story of their journey through a “deep energy retrofit” of a 1950’s rambling ranch. After exploring green and Passive House building principals to incorporate in their “fixer upper”, the couple found that while building a Passive House wasn’t financially attainable for them, incorporating as many of these concepts and techniques as possible was the next best thing. They are excited to report that employing their own standard of “Pretty Darn Good” has resulted in a surprisingly efficient home. They will talk about their experience and do some demystifying of green building principals in hopes of empowering listeners to take action into their own hands when it comes to increasing efficiency, sustainability, and comfort in their homes and lives. The Omega Center for Sustainable Living speaks about their groundbreaking, collaborative event to reimagine climate-change education in our schools and communities. This fall they will help lift and develop Drawdown Learn, an initiative of Paul Hawken and the Project Drawdown team. Led by Hawken and more than 200 researchers and scientists, Drawdown has mapped and modeled the 100 most effective solutions to reverse global warming. Now is the time to develop tools, training, and curriculum integration based on known solutions and data. What do you think needs to happen in our communities to bring about change? How can students be empowered to make a difference? Join us to learn, become an organizational partner in this work, and share your successes and ideas. Musician and inventor Brian Dewan performs on and discusses his homemade sound machines, drawing on themes of energy conduction, living systems, and creativity. Follow the Akwesasne Tribe of Northern New York, Hudson Valley Farm Hub and Seedshed from planting to harvest as they honor Native American seeds that are at risk of disappearing. Can they preserve their rich agricultural heritage and the stories that each seed holds? 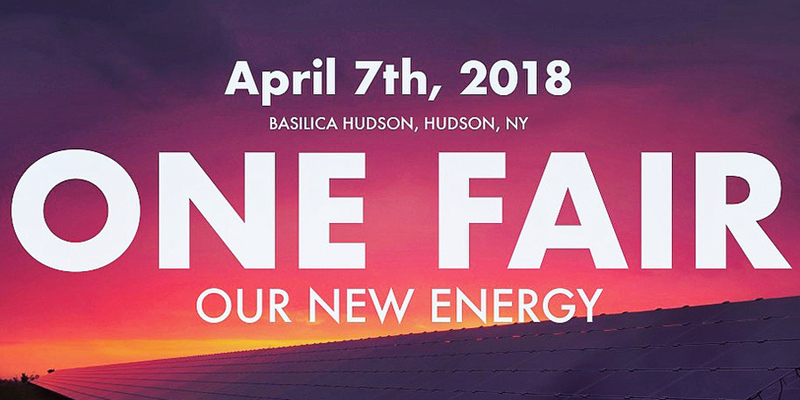 Basilica Hudson’s long-time supporter Green Mountain Energy will also be at ONE Fair, inviting attendees to learn more about their mission to use consumer choice to change the way power is made. Since Basilica Hudson partnered with Green Mountain Energy in 2013, Green Mountain Energy have signed enough customers up to their service at Basilica events to offset over 2,430,000 lbs of CO2 annually, the equivalent of planting over 252,000 trees or 2,641,664 car miles not driven! The Hudson Valley is the birthplace of the American environmental movement, with the Hudson River as central muse and catalyst. The investment and engagement of local organizations gives us hope for the future, and we are proud to be joining the dialogue.